Magma Structures in Portsmouth, UK, has created the tallest carbon yacht masts in the world. Each measuring in excess of 90 metres, the three masts are being delivered to the world’s largest sailing yacht White Pearl, recently launched and currently in build in Germany at Nobiskrug. Magma Structures engineered, designed, tested and built these highly advanced free-standing composite masts. “I think if you look at composites, Formula One has been doing great things with it for years, and the aircraft industry, it’s only now you’re seeing things like this being developed and pushing the boundary of what you can do with composites,” said Magma Managing Director Clive Johnson. The rigs built by Magma are designed to withstand bending loads of more than 40 Mn. In layman’s terms, they can withstand two times the load of a Boeing Dreamliner wing and three times that of an Airbus wing, according to Clive Johnson. 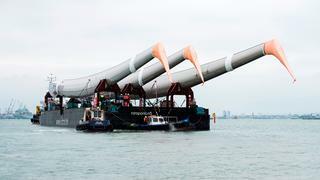 Magma spent three years developing, testing, designing and constructing the world’s tallest masts built in composites. More than 70 staff members worked on the build of the rigs. Utilising systems mounted on “wings” on the side of each mast, the masts are able to rotate. It’s not surprising that the tallest composite masts in the world – destined for the world’s largest sailing yacht White Pearl – will carry a lot of cloth. Magma reports that the masts will support a sail area that out-measures a standard football pitch. The tallest composite yacht masts in the world don’t just look impressive from the outside. They are super-intelligent as well, embedded with fibre optic sensors that will relay comprehensive load data in order to optimise performance. The sensors can also track safety warnings, historical performance data and monitor conditions. Is the newly launched J Class yacht Topaz the fastest yet?